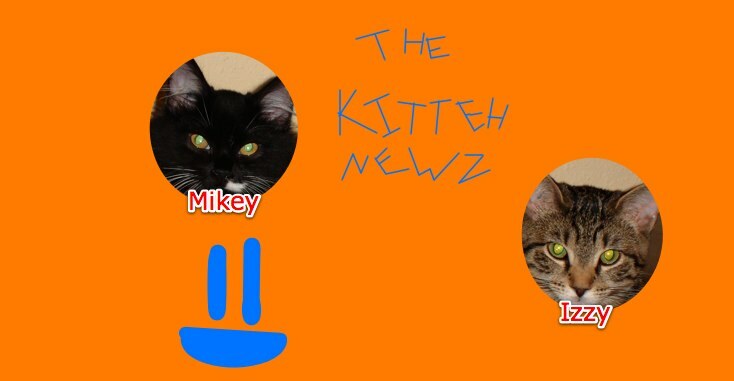 The Kitteh Newz: Feed Meh! Ha, ha. Mikey sure loves food! It's a stormy day today, so of course it's dark and stuff. I came home from some errands about 3:00 in the afternoon or so. I usually feed them dinner around 5:00. As soon as I went to the kitchen to get a granola bar, Mikey came running to me, I guess he thought it was time to eat! Then when he realized I wouldn't give him any food, he wrapped his front paws around my ankle and bit me! I told him, "Ow, Mikey! Can't you just wait another hour and 45 minutes?" He then gave me a look as if he was saying, "Well? What the heck am I gonna do about it? I'm gonna break into your clock and change it to 5:00!" It's so hilarious how us humans always try to make up what we think our pets are saying.